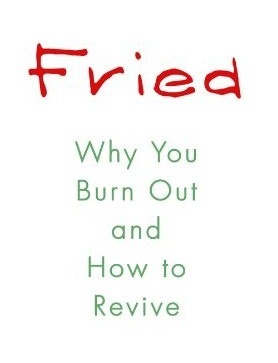 I'm loving Joan Borysenko's new book, Fried... except I think I'm fried. I hate it when that happens. I immerse myself, write and teach what I most need to learn. Joan refers to one symptom of burnout - the desire to take sabbaticals regularly - and that totally rings true for me, like an arrow to the chest. How can we move forward with our work, repair the world, heal others and not be desperate for a sabbatical every other minute? Here's Joan in the early part of the book, when she was recognizing some of her symptoms of burnout: I discovered that burnout is very poorly understood. None of the healers whom I consulted - either the traditional or the complementary - understood what the mechanics of burnout are and what is needed for recovery. I realized that unless the condition is recognized and taken seriously, physicians will keep missing it and handing out antidepressants. While medication can affort temporary relief for some people, it may also short-circuit the process of self-reflection which is ultimately where healing comes from. Plus we know that anti-depressants probably don't help mild to moderate depression - they are effective for severe depression but side effects (low libido, weight gain) may make them worse than placebo. Here are some favorite questions she posits. In what ways do adverse experiences in childhood lead to learned helplessness that increases your chances of burning out as an adult? How can you learn to manage your energy and find a dynamic state of balance? Once you pinpoint your temperament, how can you match it to the right kind of work? diminished personal accomplishment - a progressive loss of confidence and competence. I think burnout may be the new liminal space from which to most effectively prevent depression, addiction and degenerative disease. Joan weaves an interesting new voice in her book - that of her Facebook Friends. Joan writes that one FB friend: "used to think that being burned out was an admission that something was wrong with her. Now she views burnout as an invitation to come into alignment with a more elegant expression of her gifts, relationships, and overall life energy." More elegant expression of my gifts, relationships and energy? Yes, that is what I'm seeking too. This is from Joan's Facebook Friend, Shannon Kennedy: The body is where I would start to deal with burnout so that I wouldn't need to take long sabbaticals to collect my parts and return them to their original location. So often we intellectualize and go to the mind to think things through, jumping right past the physical discussion our body is having right under our nose. My perspective is this: getting to know where you feel contracted in body, thought and emotions and what it feels like to release that holding is the way out of burnout. We are fluid, flowing beings, and when we are in nonstop mode, we are perpetually in a holding contraction, thinking that we are stabilizing. OUr body is actually working overtime to support our mind's directives, like a loyal canine companion. Because of this contraction, no blood/prana can flow. Here's to releasing contraction in the way that serves you best, whether that is yoga, meditation, tai chi or some other contemplative practice.